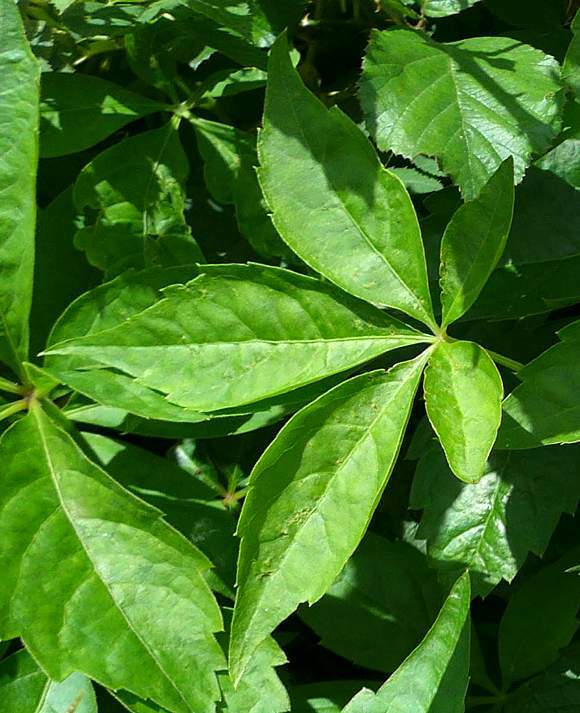 Palmate leaves with usually 5 leaflets. Lacks discs at the ends of tendrils just as per spec. 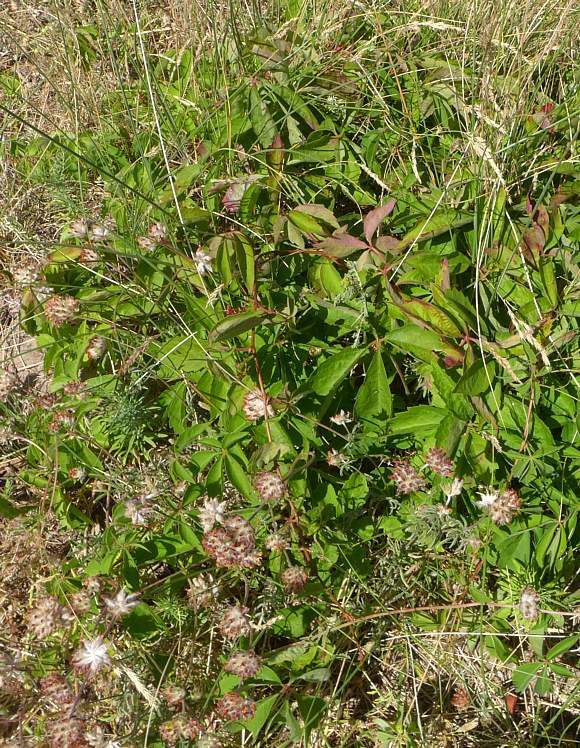 Whereas this specimen from the Leeds & Liverpool canal possesses dull-green leaves when they are supposed to be bright shiny green. New leaves are smaller. 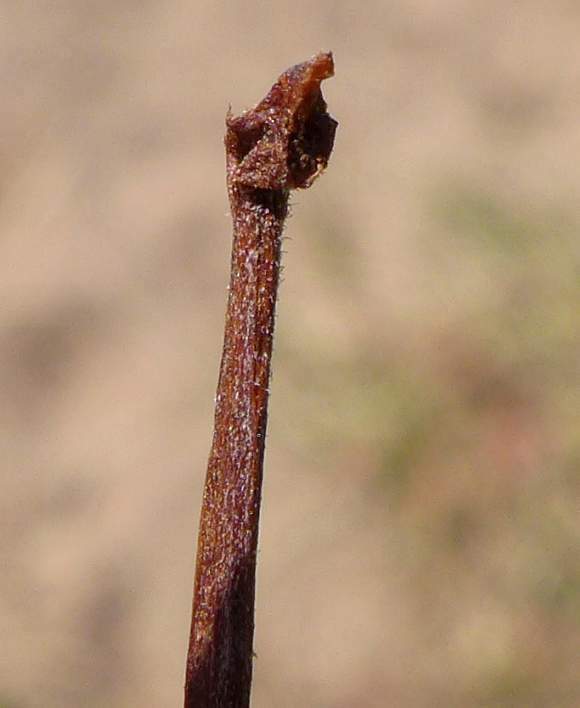 This is on a new branch with several discless tendrils. Discless tendrils. 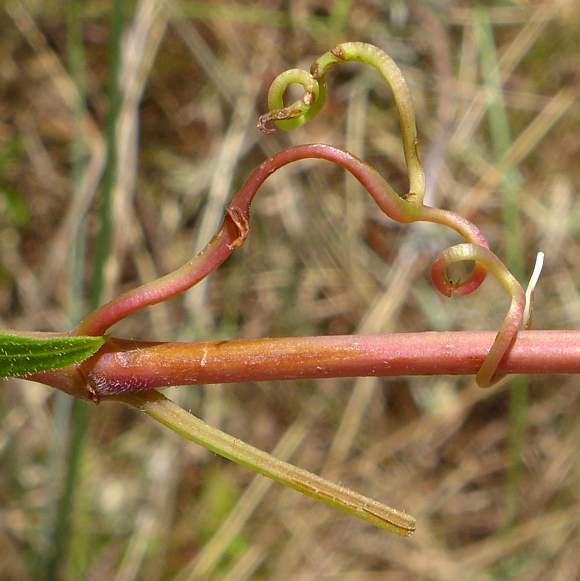 Also, the number of branches on a tendril is 3-5 (unlike Virginia-Creeper where there are 5-8 (and up to 12) branches on a tendril. 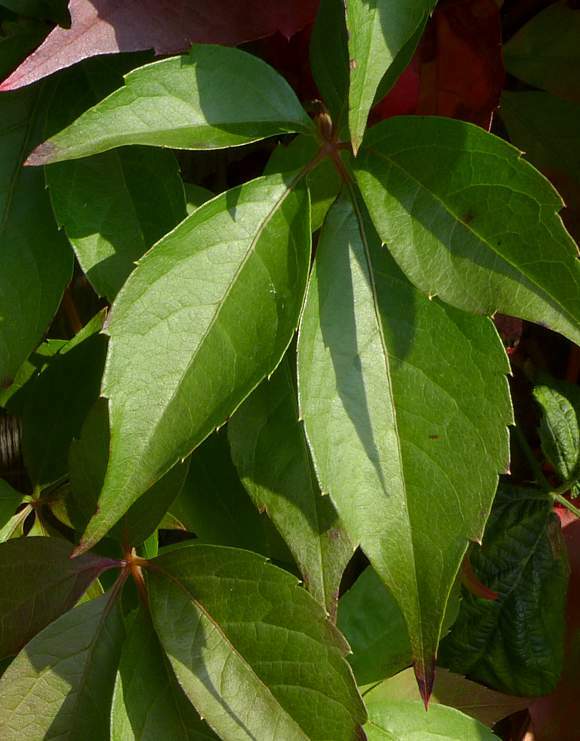 The leaves have teeth which are more acutely serrate (than those of Virginia-Creeper). Sprawling over on sandy goround in the wild here. 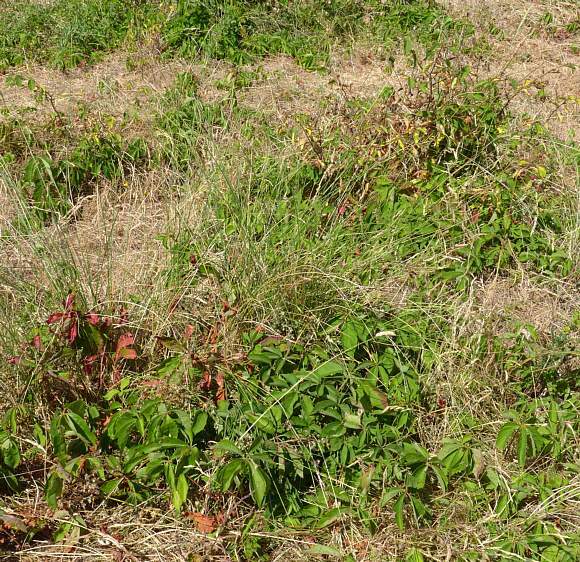 Mixed in with Kidney Vetch in lower left corner. The leaves from the sun side. 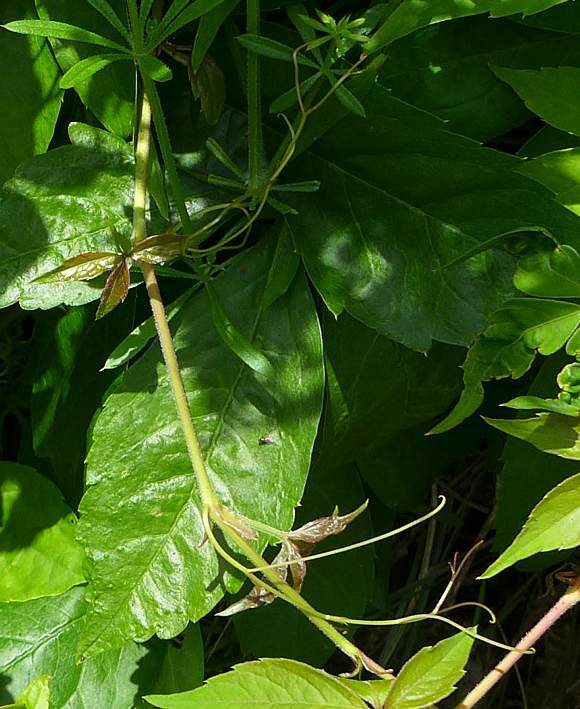 Leaves covered in very short hairs on rear making it look pale-green. 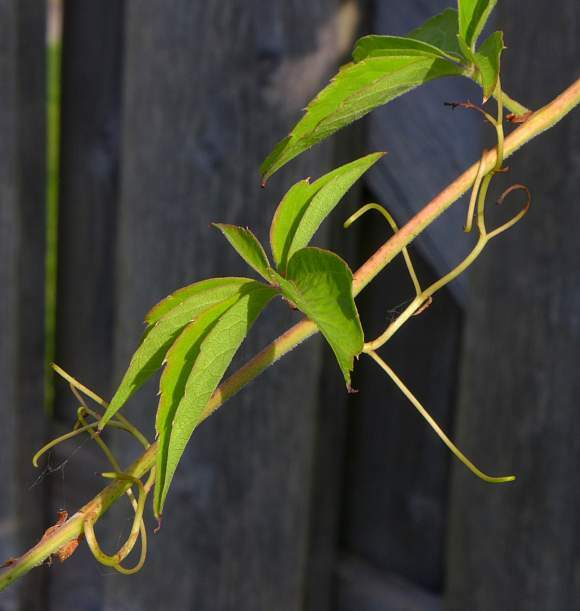 This specimen cannot be Virginia Creeper because it lasks the sticky cups at the end of the tendrils and therefore can only climb by wrapping its tendrils around things. 'What's probably got you baffled more - is what this thing 'ere is for' (quote from a Bob Dylan on the song 'I shall be free No. 10' on the LP 'Another Side of Bob Dylan' 1964). [Not to be confused with 'I shall be Free' on 'Freewheelin' LP, Dylan 1963]. 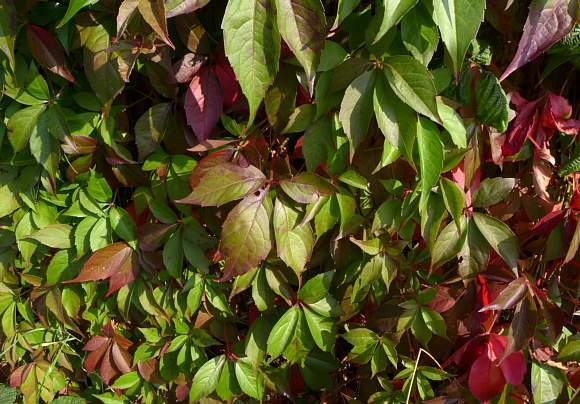 Easily mistaken for : Virginia-Creeper (Parthenocissus quinquefolia) but that has dull-green leaves and tendrils which have sticky discoidal pads on the ends, which means not only can it climb by twisting tendrils around small objects such as other plant branches but also straight up walls. 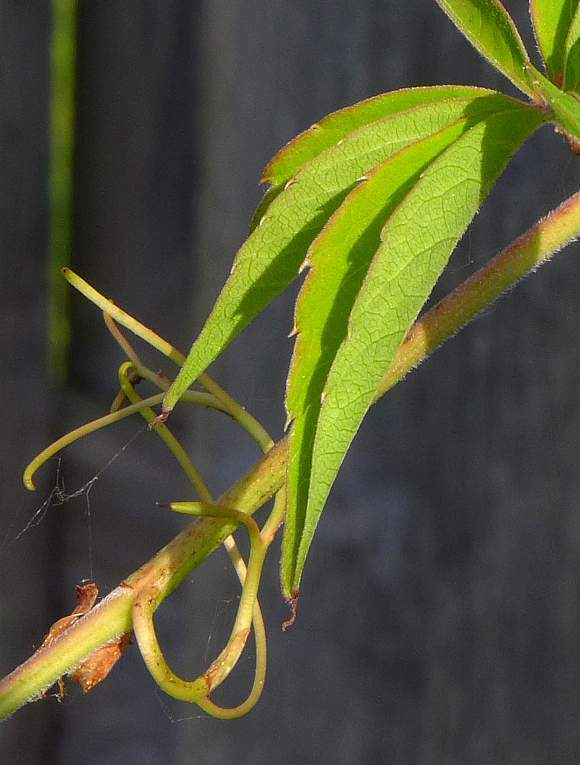 Virginia-Creeper also has 5-8 tendrils (rather than 3-5 for False Virginia-Creeper). 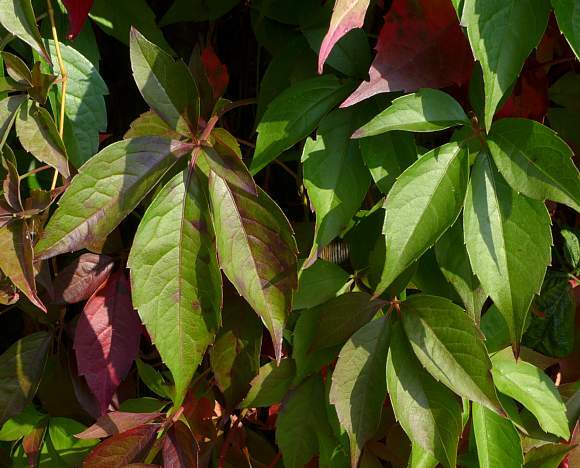 Some similarities to : Boston Ivy (Parthenocissus tricspidata) but that has (most) leaves which have either 3 lobes (rather than leaflets) or are just simple leaves. 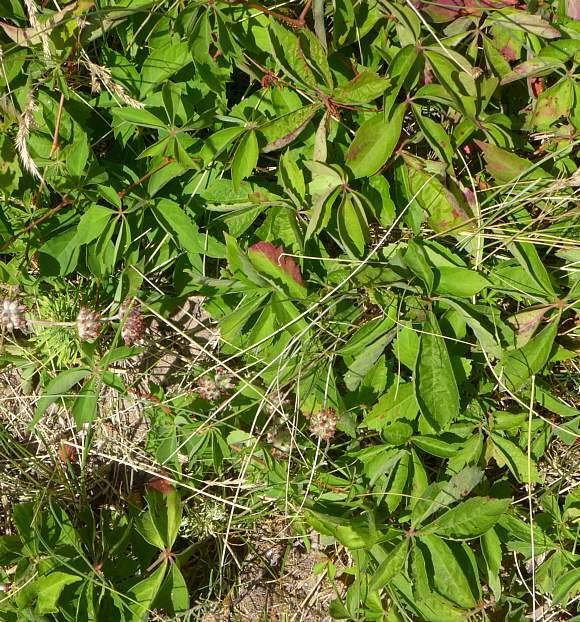 No relation to : Virgin's-Bower (Clematis flammula) or Early Virgin's-bower (Clematis cirrhosa) [other scrambling plants with tendrils lacking sticky pads and with a similar names but belonging to a differing family]. 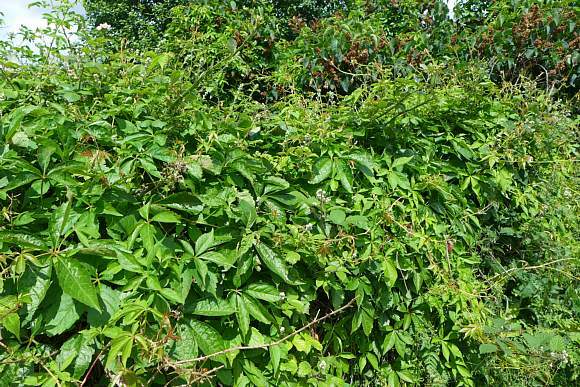 Nor is it related to Trumpet-creeper (Campsis radicans). 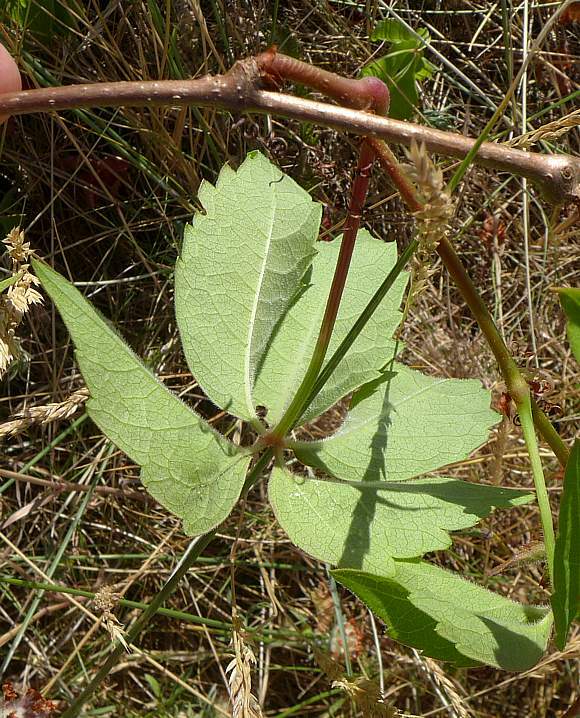 The berries, which end up being a blackish-blue grape-colour, are poisonous containing raphide crystals of Oxalic Acid which are so sharp and narrow as to easily penetrate and rupture individual cells causing lysis; it is thus a mechanical poison - oxalic acid is not very soluble in water. Death is a possibility if a lot has been consumed. 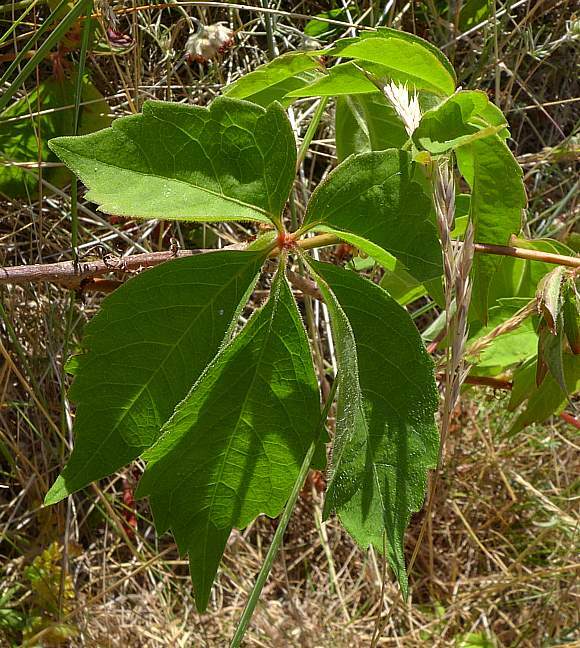 The sap also contains oxalic acid which can cause a persistent itchiness and redness if scratched. 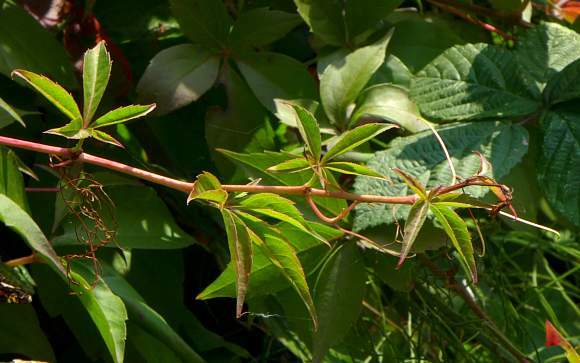 Unlike Virginia-Creeper, the tendrils on False Virginia-creeper do not have a sticky disc at their terminations, so they can only clamber and grab-hold of a purchase on other plants by means of twisting their tendrils around branches and other small objects. 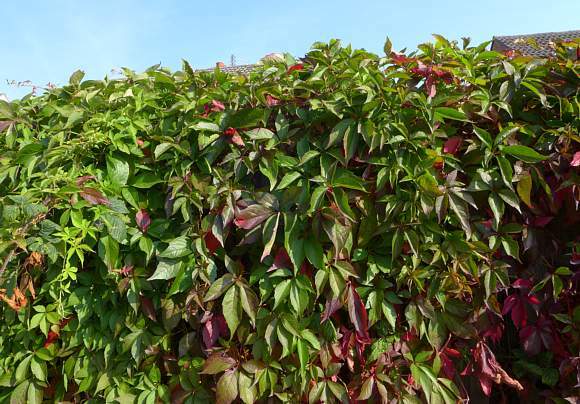 They cannot climb smooth vertical walls as can Virginia-Creeper, which it does by means of the sticky discs at the end of each tendril.